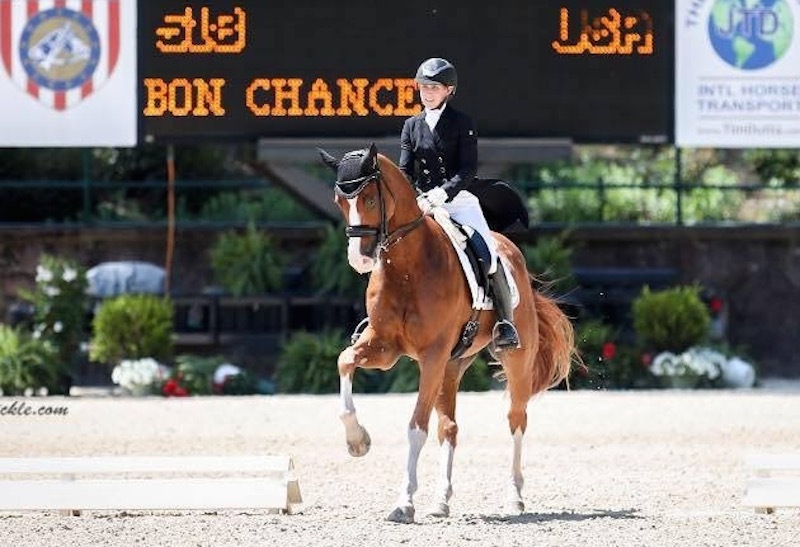 Olympic dressage rider Robert Dover has announced his pick of four young riders to receive the Christian Kennedy Future Stars Scholarships, and they’re a diverse group. The series, now in its second year, has been permanently named after 2017 recipient Christian Kennedy, who was killed in a car accident in Wellington, Florida, just before Christmas. This year’s winners are 11-year-old Paige Hendrick, the youngest-ever recipient, 15-year-old budding para-equestrian rider David Botana, 23-year-old Carly Veeser and 25-year-old Geena Martin. Not only is this year’s age range greater, but it is the first time a para-equestrian has been selected. Dover said: “Last year was the first year of the program for future stars, and it’s another way to give back to the youth in our country. The passing of one of my kids—that’s what [Kennedy] was to me—was such a big shock, so I named the program in his memory. “This year there were around 40 applicants from all over the country, and the standard was so high that the committee of myself, Charlotte Bredahl and George Williams were going back and forth until midnight trying to determine the top four. There are so many wonderful kids with great stories who are so deserving of the scholarship,” Dover added. David Botana is a Grade I para-equestrian rider—the classification for the riders with the most severe disabilities—and has overcome innumerable physical challenges in his 15 years. He was born with a cluster of congenital anomalies, including a malformed spine that had to be completely fused when he was 7. He also has significantly impaired use of his arms and hands, and riding fatigues him quickly. Still David has been on a stellar path over the past few months, and his selection onto Dover’s program represents a watershed for him and his family. “David’s only been doing para-dressage for a year, having started out in western,” explained his mother Suzanne Botana, who had managed her son’s expectations about being selected. The horse she’s referring to—and which will attend Dover’s training sessions—is one David’s regular trainer, Susanne Hamilton, competed to the Grand Prix level. The young para rider from Illinois has forged a tremendous bond with Margaret Stevens’ 17-year-old Trakehner stallion Lord Locksley in a very short space of time. At their CPEDI together, in Wellington on Jan. 18-21, the pair scored 72.88 percent to take fourth in the Grade I freestyle. The remarkable horse scored 68 percent the previous weekend at Grand Prix with Hamilton aboard. 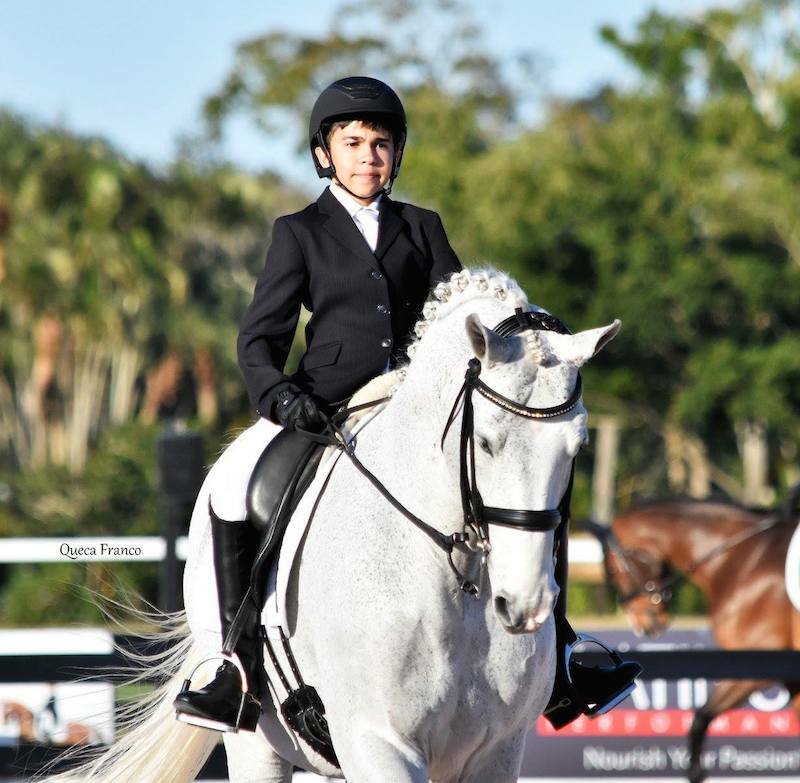 Paige Hendrick, 11, is not only the youngest to make it on to the program, but she is also the youngest American rider to earn her U.S. Dressage Federation silver medal. Her mother, Kelly Hendrick, saw details of the program on Facebook and applied “for the heck of it.” Paige has competed her Otinio to Prix St. Georges, winning the USDF/GAIG Region 8 junior/young rider fourth level championship in September. “We thought, ‘To hell with it’, even though she is so young,” explained Kelly. “We then waited anxiously checking email every 10 minutes every day until [Dover] made the selection. When the call came through, and I heard him say it, the excitement was overwhelming. In February, Paige, her mother and Otinio will make the trip to Florida from their home in Exeter, Rhode Island. 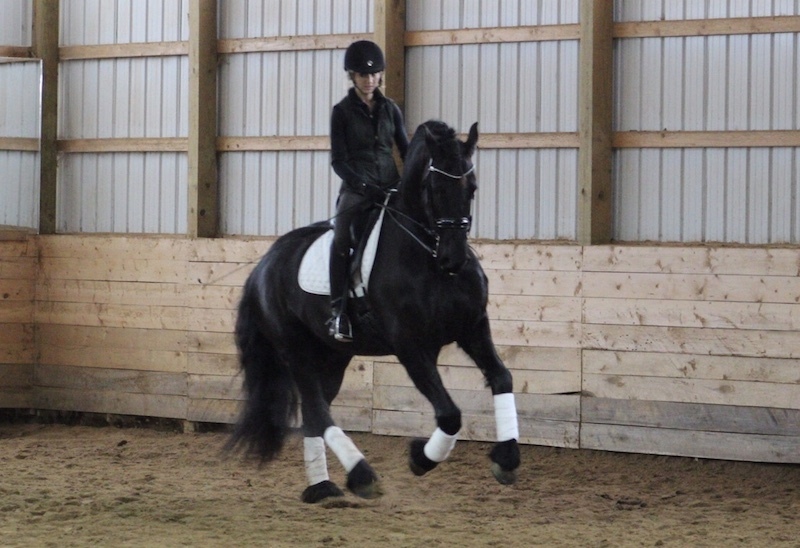 The 20-year-old New Forest gelding is 14.1 hands tall and trained to Grand Prix level. “He’s absolutely incredible. He can piaffe, passage and do 17 changes on the diagonal. He’s been a wonderful schoolmaster, but when we got him Paige was only 9 and couldn’t do the FEI pony classes] until 12. She kept progressing even though we were really just killing time,” added Kelly. Carly Veeser, 23, is delighted to have the chance to learn from Dover and take that new knowledge back to her own clients in Powers, Michigan. 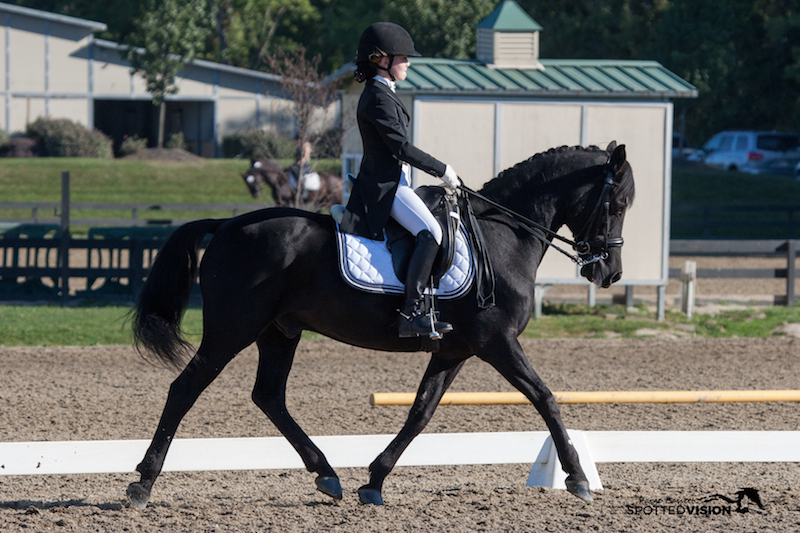 Veeser will be taking Debra LaFond’s 7-year-old Friesian gelding Gerrit K with her to Florida to train in November. She has been riding him for two years, with the help of her trainer Jesse Collins, and they have shown at second level, though they took a break from the ring to consolidate their training in 2017. “Going in November gives me time to save up and to prepare to be gone. Plus our show season, which is in the spring and summer, will be over so I’ll be able to do that with my clients first and also condition Gerrit in the heat—which I can’t do at the moment because it’s super cold right now,” added Veeser, who was surprised to learn she had been chosen. For scholarship recipient Geena Martin, 25, selection was particularly poignant. Having recently graduated from Under-25 Grand Prix classes but not quite ready for open Grand Prix, Martin, from Gainesville, Florida, had found herself somewhat directionless. “Christian told me he knew I was lost and that USEF would help me. He encouraged me to take advantage of all the resources available and really pushed me to get involved. I am so thankful that he did,” she said. Martin is currently training with Anna Merrick in Ocala, Florida, and plans to take both her developing Prix St. Georges mare Caterina and Caroline Roffman’s Grand Prix horse Bon Chance—a Bellissimo M gelding she has been riding on the under-25 circuit—along to train with Dover. Dover is looking forward to guiding the four young riders. “It’s expensive for families to put their kids with an Olympic coach, but I hope that more of our top trainers give kids chances and mentor them. I think we’ll see some of our great trainers mentoring kids on both coasts in the future,” he said. “We need to keep these kids having both the ability to train with great top U.S. trainers and also things that motivate them towards excellence, and I hope this is a good motivator for American kids. I hope that with each year more and more kids will apply, and I am so excited to be able to offer this opportunity,” Dover continued. The 2017 recipients — the program’s inaugural year — were Christian Kennedy, Robert Lueck, Sofia Schultz and Hannah Pierucci.